Update: See our video about a recent related case about time of driving. Texas is a time of driving state. What this means is that your BAC (how much alcohol you have in your system) only matters the moment you were driving. This makes sense, because that is the point that you were operating the vehicle. At the station, the officer reads the person the warnings concerning a breath test. It is now 3am, and the driver takes a breath test. The result is .083 and that goes down as their BAC. Is that the correct BAC? Of course not. Who cares what his BAC was at 3am, we want to know what it was at 1am!!! In the case that someone refuses the breath test at this moment, then a search warrant is drawn up, and eventually blood is drawn (another 90 minutes?). You see the problem. This formulates a defense in many DWI cases. When we start drinking we are all 0.0. As we drink our BAC slowly goes up, to our max BAC. The alcohol travels from our stomach and intestines into our blood, and eventually to the brain. This is called the absorption phase. Dr. Kurt Dubowski (who teaches most prosecutors) is on the record as stating that the absorption phase can last as long as 2 hours and 18 minutes after the last drink. This means if you have your last drink, and get arrested down the street from the bar, that you could reach your peak BAC in 2 hours. If the average person rises about .02 every hour. You could have been .06 when you were stopped at 1am BUT .10 when you actually took the test at 3am!!!!! 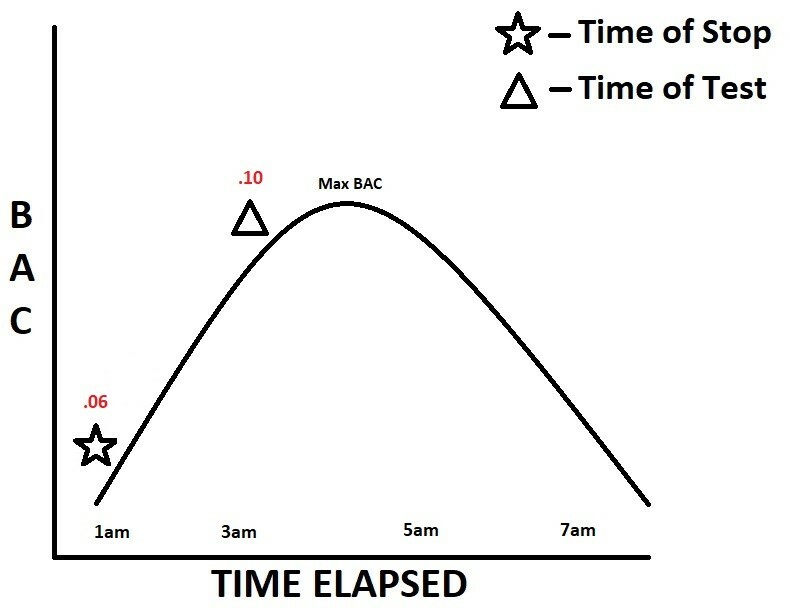 If you are arrested at 1am (symbolized by the star), and you are given the test at 3am (symbolized by the triangle), the breath test machine is recording what your BAC level was at 3am. That is not an accurate representation of your BAC at the time of driving. BUT THIS IS THE NUMBER THEY WILL USE TO PROSECUTE YOU! This is not fair, but it happens every day. That is why you need a lawyer who understands this that can teach this to a jury! The odds are stacked against you, but a quality attorney can even the odds. The time of driving defense is very powerful and jurors really use their common sense to understand this. When does this defense not work? When you lie to an officer and tell them that you stopped drinking 2 hours earlier. That kills your defense. In fact, prosecutors can turn around and use this defense against you. They can argue that you were on the way down on the chart (elimination phase). The DA can argue and say when you were stopped you were near BAC, and the delay allowed you to get rid of alcohol. In other words, and using our hypo from above. They can argue that a 2 hour delay would result in a .04 difference that is HIGHER at the time of driving. It is very important to tell the officer the truth, that you were just drinking prior to driving. Remember, it is not illegal to drink and then get behind the wheel, as long as you are under the legal limit. If you have any specific questions, please call Houston DWI Attorney Eric Benavides today at 713-222-2828. You can also contact me about your case by filling in the following information. The first consultation is always free.